When I looked out of the window at 6am this morning and saw the snow falling my heart missed a beat ! But my wife Yvonne as ever the sensible one said come on we can sort this out and she cleared a space in Excelsior Wholesale to fit some traders in and with the winery and the conference room I was able to get most of my market undercover . That left 6 outside so we cleared away most of the surplus stalls and covered and tied down the rest as securely as we could in preparation for the wind that was forecast. Soon the first traders arrived and started setting up in preparation for who knew what on a day with such an awful weather forecast ! The mood was mainly jolly and we had a couple of new traders Martin from Blue Bear Art with some fabulous pictures and Adrian with his superb coffee and Sooks ltd with a selection of her healthier sweet treats vegan and vegetarian friendly and gluten free . Dao was able to be here with her Thai food , of which I had a portion for my lunch, bringing back memories of Thailand only with better weather. Still it doesn’t matter how good the goods are if there aren’t any people to sell to, but at 10am the 1st cars started coming down the lane and the local people once again did not let us down, for the next 4 hours there was a steady flow of people turning up wind blown but happy to wander around the stalls looking, trying and yes even buying goods form the Artisan Market traders who as usual had put all their efforts into creating such interesting stands of various goods . Amongst the crowd were friends and neighbours, old work colleagues , Mr Electric and family and Amanda from Find A Biz, Tamworth all enjoying the morning browsing and even having breakfast or lunch in the Loft Bistro, and if you haven’t eaten up there in the last 12 months then you have missed a treat !! 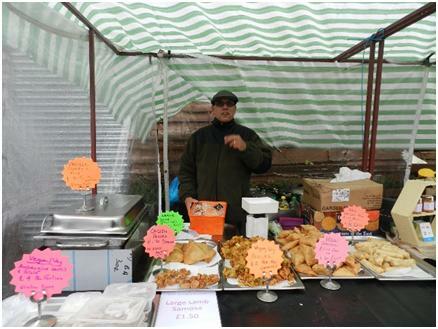 Hi Folks , Sunday was the first market of 2019 and we were out there from 7.30am setting up the new stalls that Leon and his merry band built with the rain pouring down on us , but when we were finished the market area looked much more uniform and made it easier for the traders to set up ! The other food sellers were Kneals chocolates , Ernie with his lovely creamy cheese and his cousins excellent scotch eggs of various flavours, young Matt with his local honey and last but not least Phil with his fantasticindian food! Having covered the foodie side of the market let us move onto the craft side of things , these guys spend a lot of time making the things that they sell which means that every item is unique , some of them have been with me from the start , like Jean of jmariejewelry.co.uk with her handmade necklaces , bracelets etc all made with glass beads from Ghana alongside Sarah with bitsfortheday.co.uk who is the latest addition to the market . Again one of the longest lasting members of my market is Alison with her Forever Living Products which are aloe vera-based drinks and bee-derived cosmetics, dietary supplements, and personal care products. Made for the health and well being of man and beast. I am sure that every one has heard of Aloe vera and realises that it is good for you but if you want to know more then come and talk to Alison and find out what is good for YOU! Last but not least , and if I don’t mention him he will sulk , plus it is what we do , I have Leon the partner in the business who with his son Indie grows the grapes and makes the wine, which I might add has won us an award on the International Wine Challenge , and also Leon now makes a selection of fruit flavoured gins! Hands up who started the new year with healthy living plans, including lots of fresh food and healthy eating? Now that the festive glow has faded and the winter is kicking in, it’s harder than ever to keep that focus, so we want to help you make it easier. 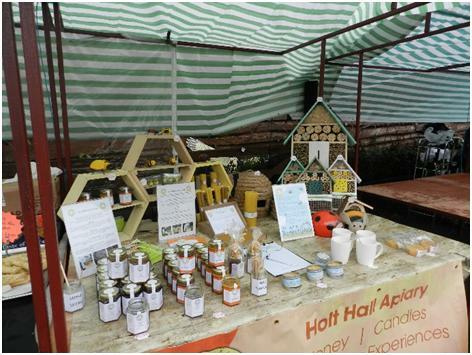 Come on down to the Valentine edition of the Buzzards Valley Artisan Market this Sunday 10th, and discover a range of delicious, locally produced food and healthy treats. You can taste test some of the produce and stock up your cupboards, making that healthy lifestyle a little less effort. There’s nothing more tempting than the smell of a delicious roast. Many of us are now more aware of where our meat comes from; we like to know that it’s British, preferably local, and reared naturally in green, flower filled fields. You can be sure that your meat adds very few miles to your carbon footprint when you buy from Stud Farm Meats, as well as being exceptional quality. All of the livestock is reared on the farm, fed mainly with their own crops and farmed as naturally as possible to produce a wonderful flavour. With their handy freezer packs, you can also stock up for the month ahead, saving your pocket at the same time. One of the biggest temptations we face is the British love of the sandwich. You don’t need to deny yourself bread altogether through. Hunnypot Cottage will be with us with her range of fresh baked breads, made without all the unnecessary sugar and additives you’ll find in the supermarkets. Stock up your cupboards with some of the homemade jams and chutneys from Karen in a Jam. Perfect on toast or crumpets, crackers or fresh baked bread, you’ll be able to find out just how tasty these are for yourself, with taste testing taking place in our shop throughout the market. Now, let’s think about lunch through the week? If you’ve got something handy and simple to put together during the day, you’ll be less tempted to snack. How about a wedge of peppered hard cheese, or oak smoked brie from Guernsleigh Cheese, accompanied by a lovely fresh scotch egg or a pie from 19 Gales. We know that it may be a little chilly browsing the market at this time of year, and there’s so much to see that by the time you get home cooking dinner is the last thing you want to do. Luckily, Phil, Hibiscus Grove Food, will be on hand with a range of delicious South East Asian cooking, including curries to taste test and take away, for an easy, stress free Sunday night. After all that healthy fresh food, it’s only fair that you have a little treat now and then. A little of everything, as they say. So how about a little homemade luxury chocolate from Kneals Chocolates, a reward for all your hard work. Chocolates make a wonderful Valentine gift for your loved one as well. If you want to get everything you need in one place, we can help there too. Cards from Flamingo Paperie, candles from Holt Hall Apiary jewellery and gifts, bespoke home décor and more. With a bottle of Buzzards Valley wine as the finishing touch to your healthy dinner, that’s Valentine’s Day all sorted too. We’ll be adding some romance to the air ourselves, with the musical talents of the fabulous Kevin Goodall and his saxophone to set the tone. With health, gifts and treats galore, what more could you need to get you out this Sunday. We’ll see you there. Roll up, roll up! It’s the final market of the year – and what a year it has been. Buzzards Valley is heading directly towards the 2nd Christmas Artisan Market, and it’s looking bigger than ever. The beauty of the Buzzards Valley Market is that the businesses are all local – which means the majority of the food is produced with locally sourced ingredients. So, you know it’s handmade home produce, with the emphasis on quality and taste. There are the regulars, including Hunnypot Cottage, purveyor of artisan breads and a member of the Real Bread Campaign, with her delicious Christmas stollen, made with homemade candied fruit peel and marzipan. Woodhouse Farm will have their fresh produce, seasonal veg, free range eggs and free range pork – everything you need, in fact, for a delicious Sunday roast or to fill the freezer ready for those Christmas parties. Karen in a Jam is another regular, and we think her jars of chutney will make a fantastic addition to the Christmas dinner. There’s so much choice, we can’t mention everyone – like Kneals Chocolate (stocking fillers?) or Hibiscous Grove (Sunday night curry). Snack on your way around with pancakes, scotch eggs and olives – and remember to try a taster or two of Buzzards Valley’s own wines and gin. Honestly, we think you should visit just for the food. Are you feeling just a little bit bored of wandering the shops and looking at the same old stuff, year after year? Mass produced plastic, designed to just fit your Christmas shopping tick list. That’s just one of the reasons you need to pop on down to a market where every gift is crafted by local businesses. The perfect gift for a grandparent who has everything? How about a personalised bauble from the children that they will rehang on the tree year after year? Sounds good doesn’t it? Get yours from JCK Design, along with a mini frame and personal verse for your friends. Keen and son will be showcasing their latest handcrafted fine wood and resin pens, which are as artistic as they are practical, and The Crafty Hoarder has a selection of personalised Christmas crates and stocking tags. Revamp an old lamp with bespoke shades from The Rose Cupboard, and have a mooch through the gifts in Edith’s Attic. Wandering through the gifts and picking the perfect stocking filler wouldn’t be the same without some festive feeling. We do love our live music at the Artisan Fair, and last month we had a fabulous sax player to serenade us. To keep up the Christmas spirit – yes, there will be mulled wine too – we’ll have more live music, carols and the chance to win a Christmas hamper. Who knows, we may even have a visit from a very special guest! Phew. There’s so much to see, and we know you don’t want to rush through your Christmas gift choices – we’ve decided to stay open for an extra hour as well. We’ll see you there – Sunday 9th December for a very Merry Christmas Market.